If it wasn't for my friends at one of my favorite websites, Fangs for the Fantasy, I might not have taken a chance on this book. But with their consistent raves about all the books in the series, I finally decided to give it a try. I'm glad I did. 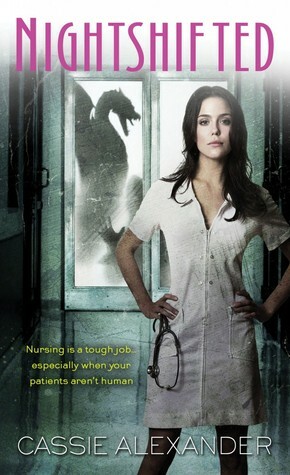 Edie Spence is a nurse who, because of her attempts to save her heroin-addicted brother (and I already know I'm a less compassionate person than her--I would have told him to take a hike a long time ago), gets suckered into working on a secret ward that caters to supernatural patients. Zombies, vampires, werewolves, and dragons, among others. Myriad complications ensue, of course; she's definitely dragged into the bad situation of this book against her will, but for the most part she's pro-active about saving herself (with the assistance of her zombie boyfriend--and no, that isn't quite as yucky as it sounds. Read the book yourself and find out). This book has a unique setting and protagonist that I've never seen before in urban fantasy. I have a medical background myself, and I can tell the author knows whereof she speaks. Being able to trust the author is so important in a story like this, and the tiny details are the proof in the pudding. Example: This throwaway line: "I hoped that some plan eventually included sleeping on it, or me getting a prescription for modafinil." There's no explanation given for this, and it's not mentioned again. However, for those who know, modafinil (Provigil) is a stimulant used for the treatment of narcolepsy and shift work sleep disorder (which Edie definitely has, since she works nights). Little things like this go far in making the book believable and drawing the reader into its world. This world is a fascinating one; I devoured the first book and have books two and three sitting on my nightstand. (Not on my Kindle; I still want my paperbacks, dammit.) I think this would be a good introductory series for those not familiar with urban fantasy, or anyone tired of its more cliched tropes. Sign into Goodreads to see if any of your friends have read Nightshifted.